Eleventh Child of ALLAN and MARY. Eleventh child of Allan and Mary, Selina Amy, the fourth daughter in the family, was born 17 Jul, 1875 at Aberdeen. She married Henry Carter, eldest son of William and Letticia Matilda Carter (nee Harman). 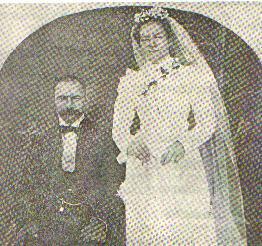 They were married 19 Dec, 1899 and lived at Barraba where Henry was a farmer, residing on the property "Plain View". They were to remain in this area until about 1911 when Henry took up the trade of a butcher in the town of Barraba. Seven of their eight children were born here, the exception being their third child (and second son) who was born in Warialda. Percival John: born 10 Oct, 1915. Selina was well known for her dominant nature and apparently did not hesitate to speak her piece at any time she thought necessary. The family moved to Glen Innes in the 1920's where Henry bought a butchers shop which he ran for many years. Henry died 12 Sep, 1949, Selina in 1963 and both are buried at Glen Innes.